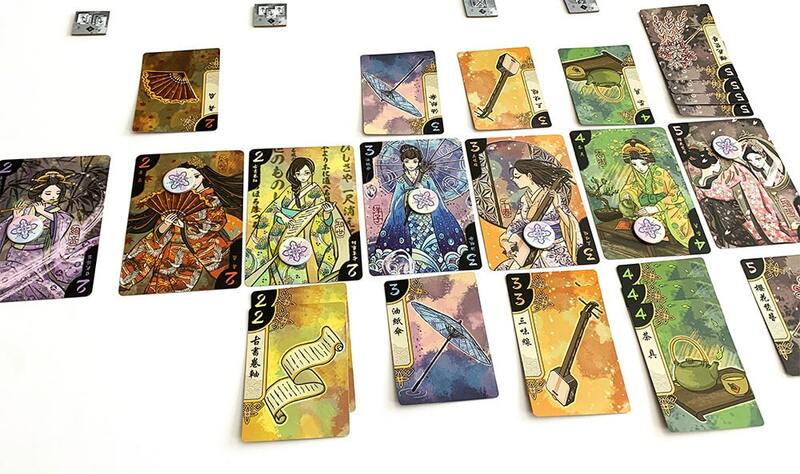 In Hanamikoji, two players compete for seven geishas’ favor by taking four actions per round to strategically collect their preferred performance item. 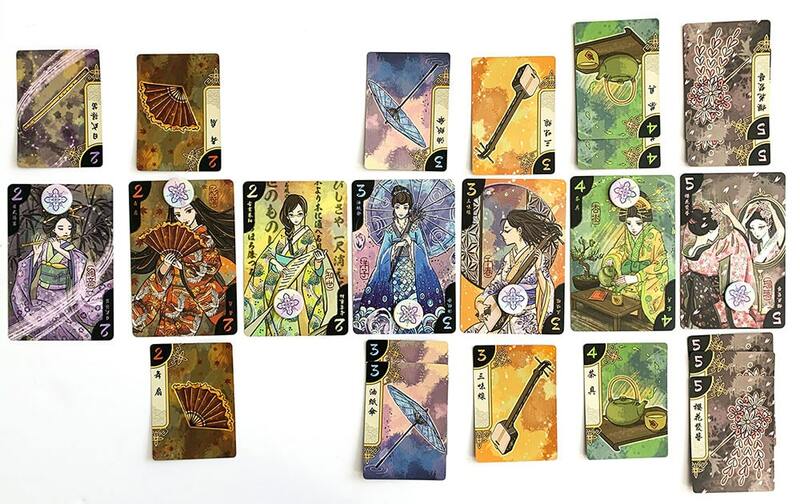 Designed by Kota Nakayama, with art by Maisherly and published by EmperorS4 and Deep Water Games, Hanamikoji is a game for two players that plays in 15 minutes or less. The object is to win the favor of four Geisha or score 11 charm points at the end of a round. 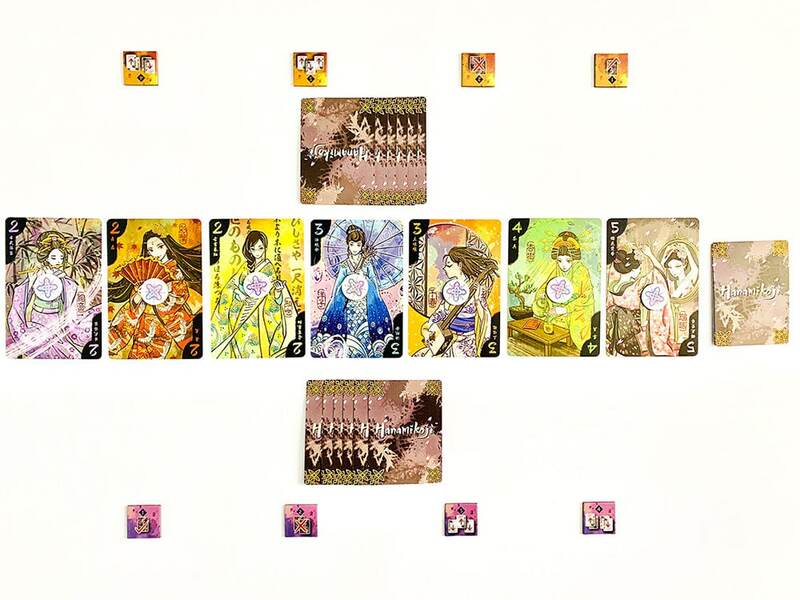 Place the seven Geisha cards in ascending order in the middle of the table with a favor token on each. Each player takes a set of four Action Markers and places them face up. Shuffle the item deck and place nearby. 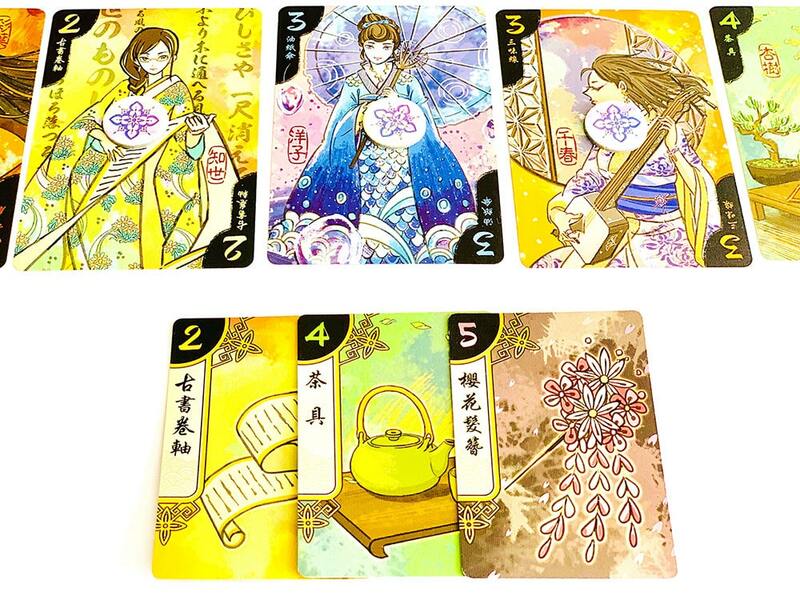 Depicted on the seven Geisha cards are charm points and a corresponding favored item. Item cards have charm points and the item name. Both sets of cards have a matching color scheme making them easy to pair together. The starting player randomly removes a card from the item deck, placing into the box without out revealing it. Then shuffle and deal 6 items to each player as their hand. Hands are hidden information and kept secret. Secret – Choose one card and place it face down under its marker. It will be revealed and placed during the scoring phase. Discard – Choose two cards from your hand and place them facedown under the marker. These cards will not be scored. Gift – Choose three cards from your hand and place them face up next on the table. Your opponent will select one and place next its corresponding Geisha to score. Place the remaining two cards next to Geishas on your own side. Competition – Choose four cards from your hand and divide them up into two sets of two cards, face up on the table. First your opponent will select one set then you. Each player places items on respective sides near the corresponding Geisha. After both players have performed each of their four actions, it’s time to score. First. 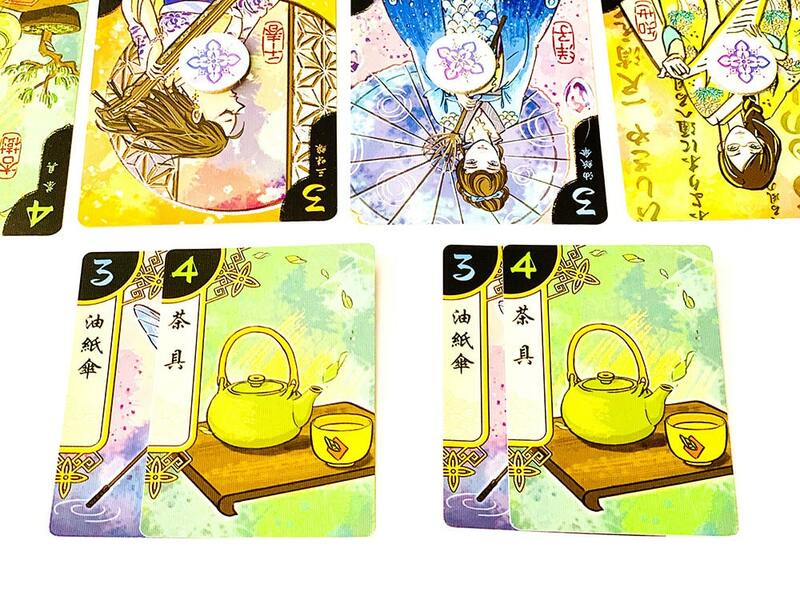 both players reveal the card under their Secret maker and move it next to its corresponding Geisha. Then they compare the number of item cards on both sides of each Geisha. If one side has more cards than the other, move the favor token to the winning side. If the sides are equal, do not move the favor marker. After moving favor markers, each player than calculates the total number of charm points they receive from the Geishas whose favor they won. If any player gains the favor of four Geishas or has a total of 11 or more charm points a winner is declared. If not, then the game continues on. Far player receives charm points from fan geisha (2) and flower geisha (5) for a total of 7. Near player gets 2 + 3 + 4 = 9 charm points. Neither has 11 this time, so they’ll play another round. Pick up all items cards on the table and box, then set them aside face down. Leave favor markers in their current position, and reset the action markers. The second player now becomes the first player and the next round continues at Phase 1. Hanamikoji is a gem of a two-player game. Its rules are simple, gameplay is quick and it offers a nice variety of decisions based on the item cards in hand. I absolutely love the solomon split (I split you choose) mechanism used for the Gift and Competition actions. Honestly, it’s not used enough in games. These two actions are the toughest decisions you have to make, and you must choose whether to act on them early or wait to see what your opponent does. The key is to try to get inside your opponent’s head after having some knowledge of which Geisha they are going for. A little light bluffing can help keep an opponent in the dark from the master plan. There are a limited number of item cards for each Geisha, so there is a bit of defensive strategy available. Using the Discard action, you can effectively block your opponent from gaining majority for a given category. The scoring phase is very simple and quick to ascertain. If you had a bad round, you can always try to overwhelm a Geisha’s favor during the next round to try to block your opponent. Hanamikoji’s phenomenal water color artwork is what originally piqued my interest in the game. Thematically it all ties together nicely. The game’s footprint is very small and is perfect for a date night, travel or lunch hour gaming with a co-worker. Winner: Near player has gained favor from 4 Geisha! The game is recommended for ages 10+, but there isn’t any reason a younger child couldn’t grasp the gameplay. I played it with my daughter; we both enjoyed it, and she even beat me a few times! If short on time, there is an optional rule that ends the game after three rounds. Then the player who earns the most charm points in the final round wins. All in all, Hanamikoji was a pleasant surprise and is a great addition to the small collection of two player games in my library. Find it on Amazon or ask for it at your friendly local game store. 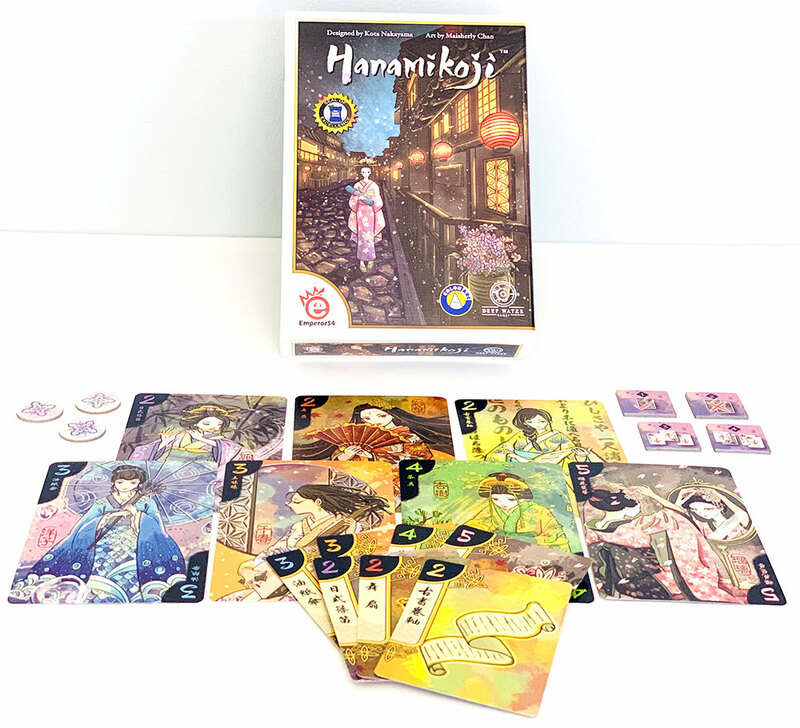 The Family Gamers received a copy of Hanamikoji from Deep Water Games for this review. Nice review of a nice game! 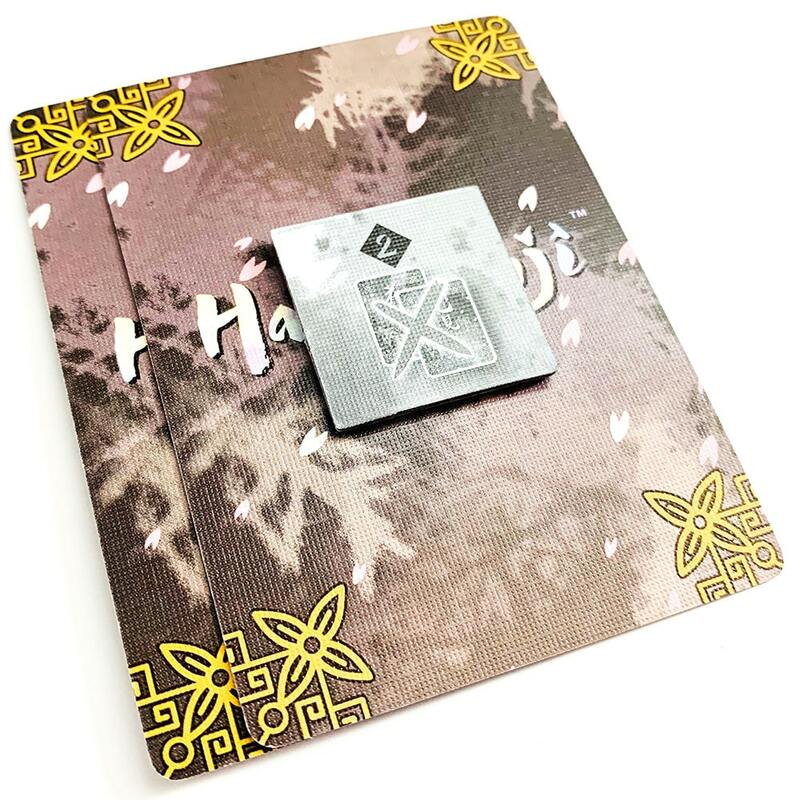 You might be interested in knowing that Hanamikoji can be played online on the board gaming platform Happy Meeple (https://www.happymeeple.com). The game comes with an interactive tutorial so that you can learn it in 3 minutes.